Handel’s “Messiah,” composed in 1741, is an evergreen of evergreens, known to people who don’t even like classical music. It has weathered the years because of its malleability, performed with ensembles on an increasingly large scale throughout the 19th century. More recently, it has taken on an alternative, less grandiose character with the historically informed performance movement. With such a multitude on offer, how to differentiate one “Hallelujah” from another? Boston Baroque seems to have found the answer. The ensemble brought to this year’s performance at Jordan Hall two things rarely associated with “Messiah”: engaging storytelling and intimacy. Much of Baroque music comes from dance forms, and artistic director Martin Pearlman’s driving tempos and strong accents shrank the distance between dance floor and concert hall. Triumphant choruses crackled with vitality, setting onstage feet tapping. As if to prove he knew faster does not automatically equal better, his instrumental “Pifa” was lambent in its serenity. Conducting from the harpsichord, he wove a coherent narrative out of the scriptural hopscotch that makes up the work’s text. 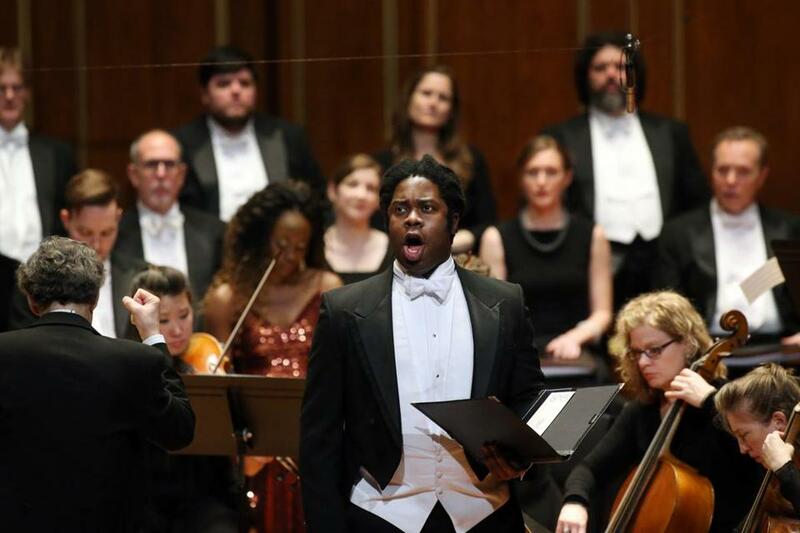 A strong slate of vocal soloists energized the lengthy oratorio. Tenor Thomas Cooley brought unmistakable enthusiasm and dramatic tension, singing with a clear, bell-like tone. Countertenor Christopher Lowrey’s lovely voice, though penetrating and precise, felt disconnected from the orchestra too frequently. His spotlight aria “He was despised” was the night’s only dragger. Bass-baritone Dashon Burton raised the dead during a standout “The trumpet will sound,” slowly folding in ever more intensity and warmth, matching brilliance with Robin Pyle’s resounding Baroque trumpet and provoking sudden applause. Trinidadian soprano Jeanine de Bique, making her Boston Baroque debut, soared through the fleet melismas of “Rejoice greatly,” and her “I know that my Redeemer liveth” was luminescent and gorgeously phrased. Equally impressive, if not more so, was the 21-voice choir. Its small size allowed for greater risks and a wider range of expression than a larger ensemble would have, a speedboat skimming the wild fugal waves instead of an ocean liner plowing through them. It summoned vocal volume and harmonic radiance beyond anything expected from a group its size, while maintaining a flawless blend. Drawing power from subtlety during the agile “For unto us a child is born,” the proclamations of Jesus’ names ignited like candle flames. As surely as Starbucks cups turn red and Santa hat sales spike, “Messiah” returns every December with period instruments and modern instruments, colossal choirs and cozy choirs. No choice is inherently superior. Dedication to delving deep into every aspect of the music differentiates the good from the great, and Boston Baroque is decidedly great.